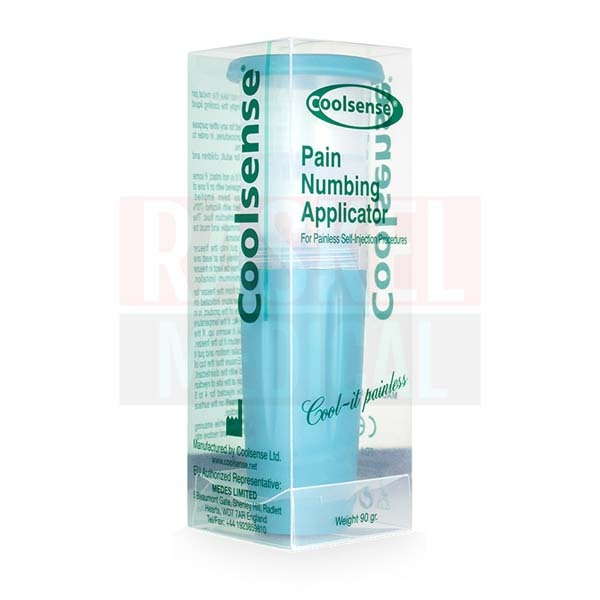 Coolsense Pain Numbing Applicator is a topical anesthetic medical device indicated to alleviate pain during aesthetic procedures without any unpleasant after effects. It works by numbing the proposed area of treatment using very cold sensations. No drugs nor other chemicals are needed to numb the skin prior to and after injections. In fact, this device can be used repeatedly with compulsory sanitation after every use. 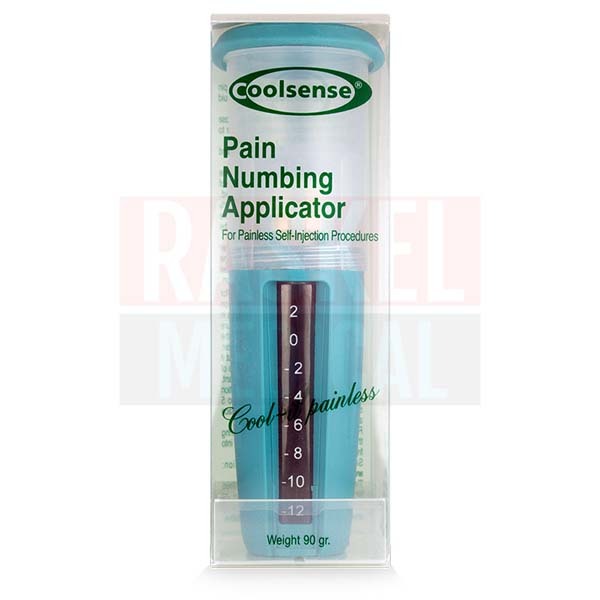 What is Coolsense Pain Numbing Applicator formulated to do? One of the functions of the skin is to detect numerous sensations to be analyzed and acted upon. Pain is one such sensation that allows us to protect ourselves from damaging or potentially damaging stimuli. In scientific terms, the pain receptor is known as nociceptor and they are scattered all over the body. In the skin, they are usually concentrated in the epidermis and dermis layer. Nociceptors are divided into four types that can detect four different stimuli which are thermal, chemical, mechanical and silent. Injections activate mechanical and silent receptors since the broken skin induces inflammation. Some patients have low pain tolerance and may feel uncomfortable during minimally-invasive dermal treatments. 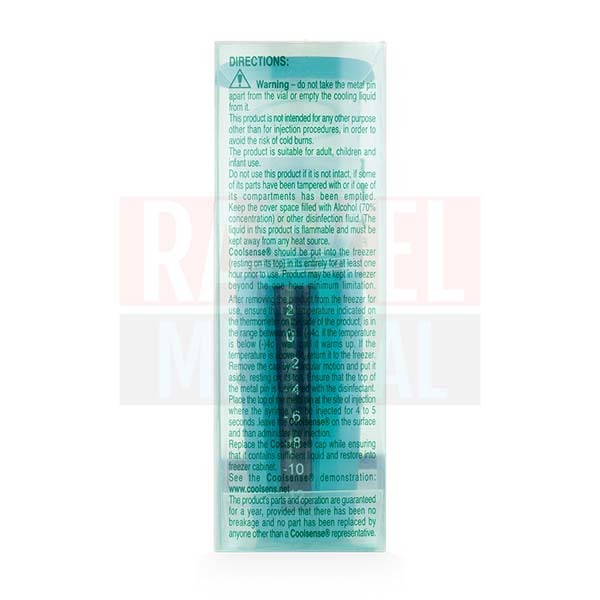 Coolsense Pain Numbing Applicator is created to safely numb the sensitive areas before injections via Cryo system. Storing the device in the freezer helps to cool down the metal pin to freezing or below freezing temperatures. Since no drugs or chemicals are involved, this device can be safely used by a vast range of patients like pregnant, breastfeeding and even pediatric patients without any side effects. It is also an economical investment as it can be used repeatedly for numerous treatments. Who is the manufacturer / country of origin? Coolsense Pain Numbing Applicator is designed and manufactured by CoolSense Medical Ltd located in Israel. If used improperly, patients can experience cold burn, a type of injury that occurs when ice or extremely cold substance comes into contact with skin. Hence, it is very important to ensure that the temperature of the metal pin is between 0°C and -4°C. Not only that, the disinfecting gel must be spread out evenly over the metal pin as an additional armor against cold burn. This numbing device can be used on all types of healthy skin. This topical anesthetic device numbs the skin without the presence of any drugs or chemicals. The simple, hand-held device consists of a metal pin, built-in thermometer and a compartment to hold the alcohol cartridge. Other devices in the “Sense Family” as manufactured by CoolSense Medical Ltd, include Tubusense TS and LipSense. These two innovative devices keep the oral cavities moist during intubation and after surgeries. This company also manufactures a hand-held device indicated for mesotherapy known as DermaSense. It is made of fine micro-needling roller head and a potent bioactive solution containing hyaluronic acid, antioxidants and multivitamins to rejuvenate the skin. This device is ideal for numbing pain caused by injections. Patients who are about to undergo any treatments involving injections like soft tissue filler, botulinum toxin, immunization and blood tests among others can use this device. Diabetic patients can also use this simple device at home before checking their blood sugar level or administering insulin. This compact, innovative device consists of a metal pin, built-in thermometer and a compartment to hold the alcohol cartridge. The alcohol solution ensures that the metal pin is always sanitized for the next use. A box of Coolsense Pain Numbing Applicator comes with the hand-held medical device and product manual guide. The metal pin imparts a cold sensation to targeted treatment areas. The areas are then numbed within four to five seconds after which pain-free injections can be administered. When not in use, store this medical device at room temperature or in the freezer. This local numbing device can be used repeatedly if it is stored safely in the freezer or at room temperature.